Welcome to the University of Bristol online resource for the identification of ticks of veterinary importance. 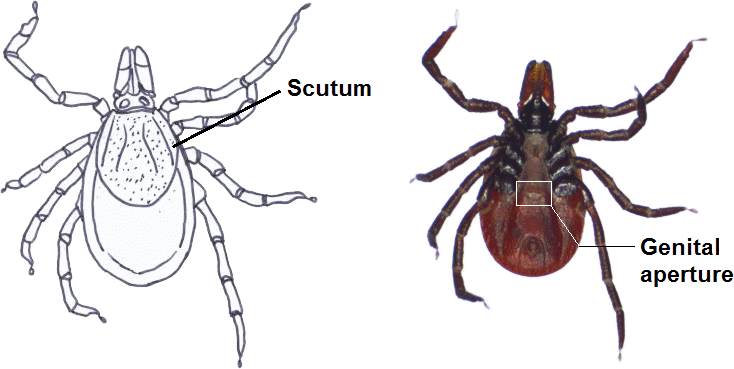 identify tick specimens, or who require information on their morphology, distribution, biology and status as vectors of pathogens. For an illustrated glossary of morphological features please click HERE. they are occasionally introduced, for example on travelling companion animals or migratory birds. All the photographs and drawings are by Dr Chrissy Berry (except where otherwise stated). To identify a specimen, please click HERE to get started with the key. 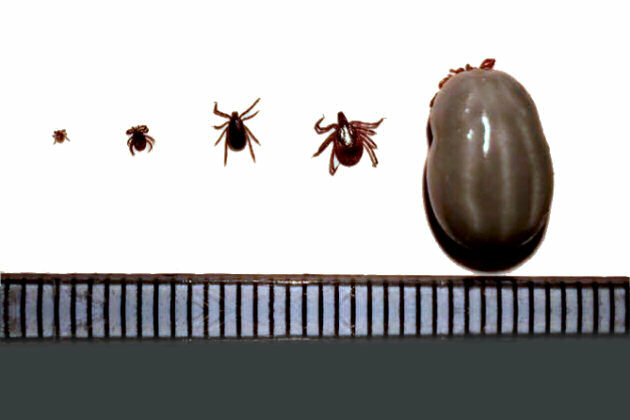 From left to right, Ixodes ricinus; larva, nymph, unfed adult male, unfed adult female, fully engorged adult female (scale mm). All photos and diagrams will enlarge when clicked. Alternatively, browse the species pages. Please note this guide is designed for the identification of adult males and adult unfed females. It will not be of use for specimens that are fully engorged. When a specimen is obtained with a scutum that does not cover the entire dorsal surface, it is important to check the ventral surface for the presence of a genital aperture (see picture). The absence of the genital aperture will indicate that the specimen obtained is in fact a nymph and not an adult female and so this guide will not be effective at identifying the specimen. The position of the genital aperture can vary with species, however it is generally located between either coxae IV or coxae III.